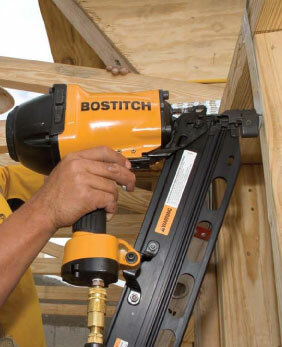 Bostitch F21PL is a powerful, versatile, and relatively affordable pneumatic framing nailer. It can accommodate a decent range of round head nail sizes from 1-1/2 to 3-1/2 inches in a plastic collated nail strip, and 1.5 to 2.5 inches in a wire collated strip. It sports a magnesium housing for durability and light weight. If you are fresh on the market for a framing nailer, you may have heard about this popular framing nailer. How does this power tool actually benefit you? Our hands-on review of the F21PL will help you find out! If you want to buy a nailer, here are some reviews that I recommend you to read such as Hitachi framing nailer, Bostitch framing nailer, Paslode 902600, Hitachi NR83A3, Bostitch F28WW, Porter Cable FR350B, Hitachi NR90AE, DeWalt DCN692M1. The Bostitch F21PL is a pneumatic framing nailer, which means that you will need an air compressor for it to work. Since it is air-powered, it is much more powerful than a battery and gas-powered framing nailer like the Paslode 902600. It will have a stronger penetration force and can easily be used to nail tough material like hardwood quite effectively. This framing nailer offers a powerful 1,050 in/lb of penetrating force. This makes common nailing tasks like sheeting, bracing and sub-flooring quite easy. One of the best benefits of this powerful nailer is that it can also be used to nail directly on thin metal sheets, no problem. You will need a decent capacity air compressor to operate this unit at its best. It works with a pressure of 90 - 120 PSI for optimal performance. At this setting, it can easily drive 3.5 inches plastic collated nails or 2.5 inches wire collated nails quite easily in any commercially available material. This model can host a decent number of nails in its magazine. Although not as generous as the Bostitch F28WW which can hold 100 nails, this model works comfortably with 60 nails. Not the best magazine capacity but still plenty for most users out there and for casual nailing, you shouldn't find yourself in a position where you are constantly reaching out for nail refills. It works with either plastic collated or the more expensive wire collated nails in a 60 nail magazine capacity for both. The nails are round-head, which is compatible with the building codes in most states. Some states prevent the use the clipped-head nails, and you can carry the F21PL for work in any state without worrying about state construction laws. Round-head nails also offer better structural integrity than clipped-head nails, so that’s that! Best, the inclination of the magazine gives a clear view of your work area. We also like the 16 inches indicator slot on the magazine. This allows you to view your magazine status at all times and know when you’re running low on nails. One of the things we like the most about this model is the excellent power-to-performance ratio. Often times we find powerful nailers being excessively heavy or big. This is not an issue with the F21PL. The relatively small weight of 8.1 lbs that it can quite easily be held in one hand and still remains maneuverable. Furthermore, the unit connects to your air compressor at the bottom and not the rear. This means the air connectors and fittings do not get in the way while connected to your compressor and remains as versatile and portable as any other cordless framing nailers. Additionally, the magnesium housing means that this nailer is both durable and lightweight. Magnesium is strong enough to withstand the daily challenges of a busy work site so it should last quite a while. We expect that it can also withstand occasional falls without taking much damage. This is a recurring advantage of a magnesium housing that applies to all power tools equipped with this durable and lightweight metal. The nails are angled at a 21-degree to offer maximum delivery and prevent jams. In case of a jam, the anti-jam mechanism makes it easy to clear in a matter of seconds. This model is quite efficient at shooting nails, even when used at odd angles. Many customers did not report jams despite shooting thousands of nails. Quite impressive! The depth-of-drive is also a big attraction in this model. You can quickly and easily adjust the nailing depth with the push of a button. This is excellent for on-the-fly nailing if you constantly need to nail different materials of different thicknesses and densities. The rubber grips are quite comfortable and can be used for long hours without any significant hand fatigue. They offer excellent overall grip even when held with wet hands. In addition to the lightweight form factor, this combination of a comfortable anti-slip grip works wonderfully well for those who need to use their framing nailer all day long. Overall, it has a decent combination of very user-friendly features that makes this model a pleasure to work with - even for heavy-duty nailing by absolute beginners. Nose-Piece: It has a 2-in-1 nose piece that can easily be changed. It will immediately convert to either a framing nailer for woodworking or a metalworking. Furthermore, the nose-piece base sits flush to your material for stability, added performance and minimal kickback. The Bostitch F21PL is competitively priced and offers a nice balance between performance, versatility, and portability. It is not the cheapest framing nailer in its price range but offers more versatility when compared to similarly priced pneumatic framing nailers like the excellent P﻿orter-Cable FR350B. It is also much more powerful than the gas-powered Paslode 902600 which is sold at almost twice the price of the F21PL. All in all, we think that the pricing for this unit is more than reasonable. Good job, Bostitch! Works with both wire-collated and plastic-collated nails. Very versatile. Can accommodate a wide range of nails sizes: 1-1/2 - 3-1/2 inches Plastic Collated and 1.5 - 2.5 inches Wire Collated. Decent 60 nails magazine capacity. Fairly lightweight at 8.1 lbs and has an excellent performance-to-weight ratio. Very user-friendly framing nailer that even beginners can use. Slanted magazine for clear-view of the nailing area. Rubber handles for a comfortable grip. 2-in-1 Nose Piece makes it easy to nail wood and metal. The Bostitch F21PL is a powerful framing nailer that can nail in a wide variety of material and accommodates a wide range of nail sizes. In addition, the push-button depth adjustment makes it very easy to work with material of any thickness regardless of nail size you are using. All this power and versatile features make this model very agile and reliable in the workplace, especially if you have to perform a lot of nailing fairly accurately. We recommend it to anyone who needs to nail in a wide variety of material every day, whether it is for casual or heavy-duty purposes. It even accepts the cheaper plastic-collated nails which do not add any significant overhead cost to this framing nailer in the long term. You also do not have to worry about strict building laws with this model since it uses only round-head nails which is the go-to nail type in almost all states.